Andrew Moffitt M.B. Memorial Web Site: ottawasun.com - Ottawa and Region - Why did he kill Andy? ottawasun.com - Ottawa and Region - Why did he kill Andy? Why did he kill Andy? BROCKVILLE -- There is a Beware of the Dog sign on the door of the old frame house at the east end of Pearl St., a house that has its porch light constantly on during the daylight hours, but appears virtually boarded up with all its curtains closed and its blinds drawn. The door is knocked, but no dog barks, and no one answers. And so the caller leaves. Hours later, the caller makes a phone call first, and waits along a side lane. The phone can be heard ringing inside the old frame house, and ringing for the longest time. Finally it stops, and a voice comes on the line. This time, Henry Danninger's mother, Gisela, answers the phone somewhere inside that old frame house, and she is reminded that opportunity rarely knocks twice. Last month, when it was written here that Henry Danninger was about to be released after serving two-thirds of a five-year sentence for the second-degree murder of University of Ottawa engineering student Andy Moffitt -- himself a Brockville boy, as fate would have it -- there were few who felt any sympathy for the drug dealer who sent Moffitt to his grave at the tragically young age of 23. Moffitt, after all, was an innocent bystander celebrating the end of exams who stepped in to mediate a fray at the Coyote Bar in Sandy Hill in December 1998, and was rewarded for his bravery with a knife in the heart as Danninger set out to settle a score with a roommate who had stolen his drug cache. 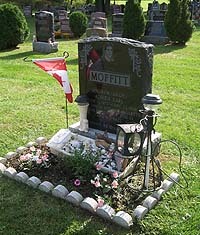 The fact Moffitt's actions ended up earning him the Governor General's Award for Bravery did nothing to bring him back to life, which is why a new candle was lit by his graveside the other day at Brockville's St. Francis Xavier Cemetery, a short 4.5 km from Danninger's home. "Would it not have been interesting to do a real story on Henry, and the events of that night, instead of such a sensational and stereotypical one?" the person had asked in that letter, but not before describing Danninger as "just a typical kid" -- he was 25 when he knifed Andy Moffitt -- and "published poet" who, during one-on-ones, was "always thoughtful and introspective." With something ventured but nothing gained, we pull away from Danninger's house, head east down Pearl, turn left on Beecher, travel east down Hwy. 2, turn right on Lyn Rd., then left into St. Francis Xavier Cemetery.